For the past eight years, I have proudly served the National Basketball League of Canada as their statistician and director of player clearances. And with that in mind, around this time I have eight NBL Canada teams competing in the postseason. It’s also around this time where I get asked by an NBL Canada fan or team owner or player who I think will win the championship. This is tough. You’re talking eight different squads, all of whom have a chance to claim the title. I mean, I could do like they do in the World Cup – play for two months and give the trophy to Germany. So here’s what I’ll do. Judging by what I know from all eight of these teams, and factoring in different intangibles, here’s my picks for the 2019 NBL Canada playoffs. And mind you, this is truly scientific, and if my bracket gets busted – like I know some of your NCAA brackets are in splinters right now – such is life. Over in the Maritimes, the Moncton (N.B.) Magic are facing the Saint John (N.B.) Riptide. This is Moncton’s first time as the #1 seed in the postseason – heck, there was a time when a team from Moncton could barely get above .500. But head coach Joe Salerno has done well with this squad, and the Riptide have essentially limped into the #4 seed here. Best of five – Moncton in 3. On the other side of the Maritimes bracket is a battle of Nova Scotia, where the Halifax Hurricanes – who have reached the championship three consecutive years and won in 2016 – face the Cape Breton Highlanders, who make the playoffs for the first time in their three-year history. So can the hoopsters from Sydney do well against Halifax? I’m thinking they may take ONE game … but in a best of five, it’ll be Halifax in 4. Now let’s check out the bracket that has Ontario and Newfoundland & Labrador teams. Don’t ask me why that is. Just run with it. 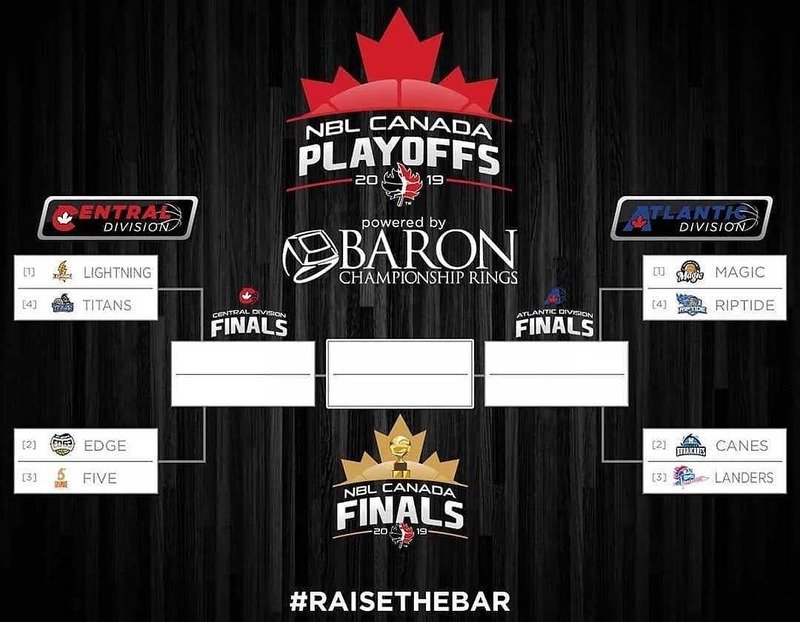 The London Lightning – possessors of four NBL Canada championships and are the current two-time defending champions – face the Kitchener-Waterloo Titans, who return to the postseason after missing the playoffs last year. I’m going to go chalk on this – although KW did make the playoffs by essentially doing what they had to do, this is the year to make the playoffs – next year will be the year to advance in the playoffs. Best of five, London in 3. The next matchup features the Sudbury (Ont.) Five against the St. John’s (NL) Edge. And on this one … I’m actually betting AGAINST chalk. The Edge have a team that’s holding together through injuries and overseas contracts, and the Five have one of the hottest one-two scoring punches in Braylon Rayson and Jaylen Bland. Best of five … Sudbury in four. So that will bring London against Sudbury in a best-of-seven. And as much as the expansion Five have shown their mettle all year … this is not the season for them to go all the way to the finals. But it will be close. Best-of-seven … London in six. Back to the Maritimes. I like the idea of Moncton versus Halifax in the semifinals, and although Halifax has some scoring guns – and they’ve been to the finals the past three seasons – I’m really thinking that this may be the year of the Magic. Best of seven … Moncton in seven. And now we come to the big finals. London Lightning versus Moncton Magic. This will go to a full seven games, for sure. Both teams have equal skills. How many Albany Patroons alumni does each team possess? The Moncton Magic has one Patroon – Nick Evans, who played a few games last season. The London Lightning have two Patroons – Xavier Moon, the NAPB Rookie of the Year last season, and Marvin Phillips, who played for the Patroons in the 2006-07 campaign. Two Patroons beats one Patroon. London Lightning in seven, London takes the title and their fifth championship, Moncton puts up a valiant battle but comes maybe one basket short. Now mind you, this is my bracket and I’m sticking to my picks. And that when it comes to sports wagering, please take into consideration that this is a friendly bracket and no finances are being wagered or gambled on the outcome of these matches. The NBL postseason begins this Thursday, with Cape Breton visiting Halifax, while Kitchener-Waterloo faces London.